Article 6 of this series will be an analysis of middle blocker attacking excluding the slide attack, which was the subject of Article 5 of this series. The focus will be primarily on the ‘1’ Set and ‘3’ Set with an analysis of serve receive and transition footwork and court positioning. Similar to the other articles in the Critical Analysis of Skills Series, we will observe and analyze the techniques being utilized by professional international players from around the world. The first question to be answered in this article is to determine what terminology should be used to describe the middle when they are attacking. Roster positions are generally listed as Outside Hitter, Middle Blocker and Opposite. In keeping with these position descriptions, I will use the term Middle Blocker even when making reference to their attacking techniques. Assuming a player has the time available to get there, is there an ideal or advantageous loading area on the court to prepare for a 1 Set and the 3 Set attacks? Is there a more beneficial approach angle in which to transition for the attack? Are there things that a hitter can do to create larger margins for success in out-of-system situations? At the club and high school level, a frequent common occurrence that I have observed over the years is for the middle blocker to execute an approach perpendicular to the net in a straight line toward the predetermined set location even though the opponent’s middle blocker is already standing in front of where they are approaching to hit. As you can see from the following video, it even happens at the international level. Cristina Chirichella of Italy attacks versus the solo block by Irina Zaryazhko of Russia. The perpendicular approach directly at Zaryazhko makes it makes it easier for her to block and more difficult for Chirichella to work the attack around the block. I have occasionally asked middle blockers if it is easier to block a player running straight at them or to block a player approaching at an angle? The answer has usually been that it is much easier to see and block the attacker running straight at them. The follow-up question is why would they choose to approach in a way that makes it easier for the opposing middle blocker to defend them when they are the attacker? Another question to ponder would be why they wouldn’t prefer to approach into a seam or gap to force the defending middle blocker into having to make a physical lateral movement to block their attack? Stefana Veljkovic of Serbia illustrates how it is possible to create an approach angle that makes it more difficult for Irina Zaryazhko of Russia to see and line up on the middle attack. In this serve receive situation, Veljkovic has a loading area approximately twelve feet off the net and approximately ten feet from the left sideline. The approach angle toward the setter appears to be approximately near the forty-five degree range. You can clearly see Zaryazhko watching the setter as Veljkovic runs past her to the inside for the attack kill despite the reach-in block attempt. One of the contrary thoughts and opinions I have heard about approaching at an angle is that it would be too difficult to attack in the opposite direction to the approach line of the attacker. There are some adjustments that the hitter can make to execute a cutback shot to their left. There can be coordination between the setter and the hitter to use a push set that travels past the right hitting shoulder toward the left shoulder. 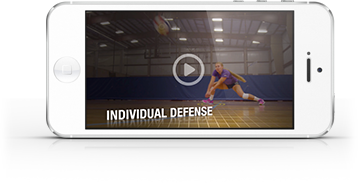 The attacker can rotate the body and shoulder as the set passes across the body to attack, or they can remain facing the setter on their approach line and hit a cross-body attack to the left. Eda Erdem Dündar of Turkey and playing for Fenerbahce Grundig ISTANBUL, executes a cutback shot to her left in the next video. I would describe Erdem Dündar’s technique in this situation as a combination of a body turn and a cross-body attack finish where there is a slight delay near the top to let the set drift toward the attacker’s left shoulder. The angle of the approach causes the opposing middle blocker to initially move and reach in toward the attack approach line allowing space for the cutback kill inside the block. There will be situations or circumstances within a play which will not allow you to always get to your favorite or preferred loading area to begin your attack approach. The next video shows Milena Rasic from Serbia with the VakifBank Istanbul team passing a free ball before attacking a 1 Set. It may seem obvious to you as you view this play developing where you would approach to in order to maximize your opportunity for success. Intuitively, it seems that approaching either inside or outside of a blocker forcing some sort of a movement with their body or arms would create an advantage for the attacker. Is it possible that we could add an element of strategy or foster and encourage an understanding of how to create an edge in the odds of obtaining successful outcomes? Develop and define an attack philosophy and strategy for different situations before they happen with an ability to adapt and adjust that strategy if necessary. If we can incorporate building the volleyball IQ of the players we work with, we will be enhancing their abilities to become more successful in both in-system and out-of-system situations. The preceding video shows how Eda Erdem Dündar adjusts to a serve receive pass in the front zone forcing the setter to move forward to set the ball. You are able to see Erdem Dündar focusing on the passer and able to immediately adjust her footwork to get herself in position to attack in front of the setter. You are also able to observe how lateral movement creates problems for the defending blockers in both timing and location. When movement is required going to the attacker’s left, it creates opportunities to cut the ball back into the court by using a footplant that minimizes the amount of drifting toward the sideline. The most common technique used by the vast majority of attackers is what I will refer to as a left step “Toe-In” footplant step driving the left knee and hip inward as a braking step to minimize drift. Another common term I have heard used by other coaches to describe this motion is a “step-close” footwork pattern. This footplant motion is sometimes referred to as pronation of the foot. The Merriam-Webster dictionary defines pronation as a rotation of the medial bones in the midtarsal region of the foot inward and downward so that in walking the foot tends to come down on its inner margin. The photo sequence of Eda Erdem Dündar shows the final left step Toe-In footplant. The Toe-In footplant occurs in the Row 1 – Frame 9 through the Row 2 – Frame 2 photo sequence. The hitter attempts to get the left hip and shoulder around in a position which is closer to the net than the right hip and shoulder. The left foot and knee is angled inward or toed in toward the direction of the setter. 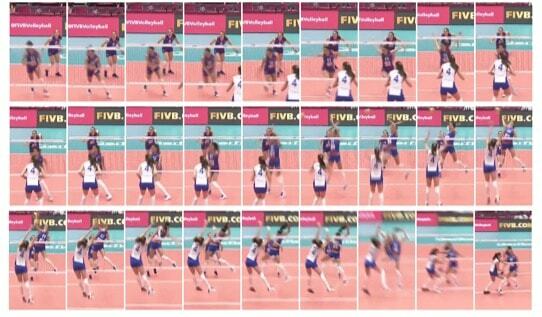 The next video and photo sequence shows Stefana Veljkovic of Serbia using her Toe-In footplant to attack a 1 Set. 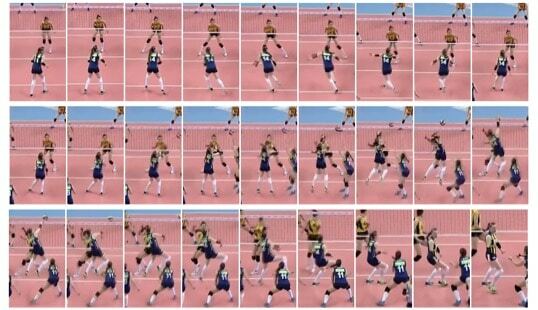 The Toe-In movement for Veljkovic is from the Row 1 – Frame 6 through the Row 1 – Frame 8 photos. Veljkovic has a deeper knee bend at the bottom of the approach than Eda Erdem Dündar which can assist in achieving a more vertical jump to the ball and uses a cross body swing technique to beat the block. In the front view of the same attack by Veljkovic, you are able to see the Toe-In footplant in the Row 2 – Frames 1 through 3 photos. In this specific attack situation, Veljkovic has planted slightly outside the shoulder of defending blocker Irina Zaryazhko of Russia allowing for the cutback attack kill. Thaisa Daher Pallesi of Brazil has a very similar Toe-In footplant technique to Stefana Veljkovic of Serbia. The Toe-In motion is seen in the Row 1 – Frames 3 through 8 side view photo sequence. In this view, you are able to see the importance of using both arms to jump to give the setter a visual target of where to locate the set. You can see the set being directed toward the left hand of the attacker in the Row 3 – Frame 1 photo. The Toe-In motion contributes to getting the left shoulder in a forward target position to direct and locate the set in front of the hitting shoulder. Although the focus of this section of the article has been on the Toe-In footplant, another component that can be analyzed by the reader is the approach timing of the hitter in relation to the set. The easiest check point for timing could be to analyze where the attacker is in the approach process when the ball is in the setter’s hand just prior to the release of the set. In the back view sequence above, you are able to see in the Row 2 – Frame 6 photo that Thaisa Daher Pallesi has started her upward jump with her legs and that her ankles have flexed and the toes are just beginning to leave the floor. The next frame shows that her feet have just come off the court as the set is beginning to leave the setter’s hand. I would consider this timing to be a fast timing tempo set and attack. On a slower tempo set timing, the hitter will typically leave the ground after the set release and will contact the ball after it has reach its peak and has begun to descend. The video of the above sequence is provided for your observation and analysis. You can see the real time speed and timing along with a slow motion replay for a closer and a more detailed analysis. The front view photo sequence above is from a different attack video than the side view and back view sequences preceding it. However, the Toe-In footwork is fairly identical in both attacks. In this photo sequence, you are able to see that the timing tempo of the attack is a little slower than the previous example. Compare the Row 2 – Frame 3 photo with the ball in hand position of the setter and the progress of the attacker’s approach. Thaisa is near the bottom of the approach load with the legs and has not yet started her upward drive. In the previous example, Thaisa Daher Pallesi was in the Row 2 - Frame 5 attack position on the setter’s contact. At this juncture in attempting to critically analyze the last three examples of the Toe-In footplant technique, I have been on the internet reading a wide variety of studies and articles on subjects such as the relationship of certain techniques which could possibly contribute to anterior cruciate ligament Injuries in female athletes. Other areas of study have been the biomechanics of jumping and landing technique. The Toe-In footplant has been described in many articles as a pronation of the foot, and there are a multitude of scientific articles with very technical explanations and study results. There are also articles with words such as “The Myth of Over-Pronation”. Personally speaking, I am open to the thoughts and opinions of the experts and professionals that are far more knowledgeable in this subject area of pronation and its impact on possible knee injuries. The Toe-In footplant is definitely one of the common elements of a vast majority of international players when observing their approach techniques. The main purpose of focusing on this element was to highlight its prevalence in footwork technique. While there are contrary opinions regarding pronation in the takeoff jump, there seems to be a consensus of opinion that landing on two feet after an attack will serve to minimize or reduce the odds of a more serious injury. In my observations of other coaches, there are two primary systems of running the 3 Set attack. The first system is to set to a fixed location on the net. A common location would be approximately ten feet from the left sideline in the gap between the opponent’s Middle Blocker and Opposite or Setter. The second system would be to set the ball a specified distance away from the setter as they move forward or backward along the net. Through my observations over the years, setting to a designated spot on the net is by far the most prevalent system run by middle blockers. Foluke Akinradewo of the USA shows the location of a typical 3 Set gap attack. Akinradewo was able to successfully execute a fairly straight-in perpendicular approach line by attacking the gap between the two blockers. Just as there are advantages in utilizing an angled approach for the 1 Set attack, the same philosophy can be used for the 3 Set attack as well. The angle in this situation was created by an inside to outside or a right to left approach movement pattern by Thaisa Daher Pallesi. The two clips of Akinradeo and Thaisa are synced on the setter’s contact with the ball and are shown side-by-side. Both clips show a Rotation 2 serve receive situation. The two photos show how the USA and Brazil position their players in a Rotation 2 serve receive situation. Focusing on the middle blockers, Akinradewo starts a little in front of the ten foot line and farther inside the sideline than Thaisa, who is slightly behind the ten foot line and near the sideline. 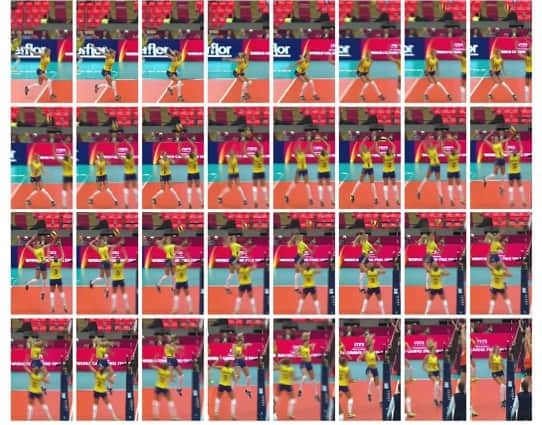 The different locations of the serves and the speed of the serves dictate the different timing and transition patterns exhibited in the accompanying videos. If you compare the positions of the setters and the hitters when the ball contacts the setter’s hands, they are very similar despite the differences in their approach patterns. Block transition attacking presents another variable to consider with regards to which direction you should turn off the net after a blocking action and which way you should turn to begin your approach to the ball. The predominant occurrence among players observed is that they turn off the net in the direction of the attacked ball. In other words, if the attacked ball travels to the left side of the block, they open up to the left and if the ball is to the right side, they open up to the right as they transition off the net. The direction of the pivot turn before the approach is a little more variable among players, especially when the middle blocks an opponent’s left side attack near the antenna. Stefana Veljkovic of Serbia demonstrates her block and transition 1 Set attack technique. From observations and analysis of international players, the counter-clockwise transition footwork used by Veljkovic appears to be the most common direction to turn before a 1 Set attack approach. The most common direction to turn for a 3 Set transition attack has been observed to be a clockwise footwork pattern preceding the attack approach. The next video shows Thaisa Daher Pallesi transitioning from a back 5 Set block to set up an angled 3 Set approach attack into the gap between the two opposing blockers. How does out-of-system ball control alter a team’s offensive system as it relates to middle blocker attacking opportunities? The most obvious situations contributing to this would be a poor pass in serve reception and an errant dig in a transition opportunity. Having the ability to set and attack a first tempo middle blocker set from eight to twelve feet off of the net will often produce one-on-one hitting opportunities. This will also have the benefit of holding the opposing middle blockers to create advantages for the other attackers. Lindsey Berg and Foluke Akinradewo of the USA demonstrate this scenario versus Korea at the London 2012 Olympics. Milena Rasic of Serbia is shown running a Gap 3 Set to a specific location on the net as the setter is forced to move backwards toward the left sideline to deliver the set. Rasic uses a cross-body cutback armswing attack to terminate the out-of-system set. Another circumstance would be a chaotic block transition opportunity executed by Stefana Veljkovic of Serbia with other players inadvertently causing distractions or impediments creating an out-of-system situation. Although the dig location would be considered an in-system contact, the lack of opportunity to transition off of the net by Veljkovic created the necessity for an out-of-system approach and attack. I may have taken a few liberties in using the term “out-of-system” when referring to the examples in this section of the article. A case could arguably be made that if you are able to set your Middle Blocker with a first tempo set, you may technically not be out-of-system. The main objective of highlighting these situations is to place an emphasis on attempting to expand the limits often placed on our players and trying to challenge the comfort levels of our teams to achieve beyond their expectations. When I first started coaching in the early 1990’s, I often heard other coaches utilize the term “middle blocker armswing”. Some of the references were to loading with a high elbow and using an abbreviated armswing arc to hit the ball quickly. When I was coaching at the collegiate level, I compiled a video collage of the All-American Middle Blockers and observed that the majority of the middle blockers actually had armswing techniques resembling those of a majority of the outside hitters analyzed. The only adjustments were in the timing of when they began their approaches to compensate for the air times of the various sets. There are a multitude of situations in which the middle blocker goes unnoticed and is under appreciated during practices and in matches. It is often stated by coaches at all levels that the middle blocker may be the hardest workers in the gym. Defensively, they are required to block the largest portion of the net and generally take a higher number of block jumps. Offensively, they often serve only as a decoy while working to be available to attack. They are used to hold the opposing middle blockers to create one-on-one opportunities for the outside hitters. At a collegiate setter’s camp during an offensive system strategy discussion, a very experienced collegiate coach opined that you should attempt to establish your Middle Blocker as an attacker within the first five setting opportunities of the match if possible. He used the mantra “It works, even if it doesn’t work!” eluding to the fact that even if the play didn’t result in a kill, the opposing blockers would have to necessarily honor the middle blocker as a possible attacking option in subsequent rallies.